Neutrons, simulation analysis of tRNA-nanodiamond combo could transform drug delivery design principles. A unique combination of experimentation and simulation was used to shed light on the design principles for improved delivery of RNA drugs, which are promising candidates in the treatment of a number of medical conditions including cancers and genetic disorders. The discovery involved ORNL’s Spallation Neutron Source, which provides the most intense pulsed neutron beams in the world for scientific research and industrial development, and ORNL’s Titan supercomputer, the nation’s most powerful for open science. 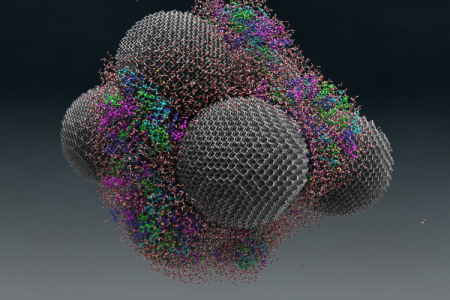 By comparing the SNS neutron scattering data with the data from the team’s molecular dynamics simulations on Titan, the researchers have confirmed that nanodiamonds enhance the dynamics of tRNA when in the presence of water; This analysis was performed with the Pegasus WMS. The DOE Panorama project has developed an SNS workflow to confirm that nanodiamonds enhance the dynamics of tRNA in presence of water. The workflow, enacted by the Pegasus Workflow Management System, calculates the epsilon that best matches experimental data. These calculations were for 10 ns each and the workflows used almost 400,000 CPU hours of time on DOE leadership class systems.